We had a sunny day today. It was perfect for a walk with my daughter in the neighborhood. After that fresh air, she was so exhausted that she took a nap of nearly three hours. The afternoon being so quite, I decided to take a little time for my self by enjoying a glass of milk and some muffins. Yes, I know a glass of milk doesn’t seem so grown up; but what can I say I love milk. I am neither a tea person (except mint tea) nor a coffee person. I took this recipe once again from my favorite book; it seemed easy to make and the freshness of the oranges and the crunch from the poppy seeds gives it such a wonderful and original taste. To enhance and deepen their subtle flavor, steep the seeds in milk before adding to the batter. In a small bowl, combine the poppy seeds and milk and let stand for 20min. In a bowl, stir together the flour, baking powder, baking soda, salt, and orange zest. Set aside. By mixer, beat the eggs until blended. Add the sugar, butter, the juice, and milk poppy mixture and beat on low speed until just combined. Add the dry ingredients and mix just until moistened. Spoon the batter into buttered muffin cups. Bake in a preheated 400F oven for 15-18min in a standard muffin cup and 12-14 min in mini-muffin-pan cups. Let cool in the pan on a wire rack for 2min, and then turn out onto the rack. For the glaze, stir together the orange juice and icing sugar until smooth. 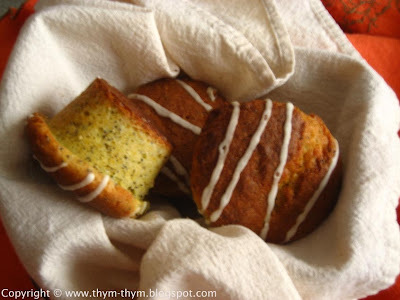 Drizzle over the tops of the muffins in a zigzag pattern. Dans un bol, melanger les graines de pavot et le lait et mettre de cote pendant 20min. Dans un recipient, melanger la farine, la levure, la bicarbonate, sel, et le zest d’orange. Laisser de cote. En utilisant un mixer, battre les oeufs. Ajouter le sucre, le beurre, le jus d’orange et le mélange lait-graines de pavot et melanger jusqu’a tout soit homogene. Y verser les ingredients secs et melanger doucement sans trop battre. Remplir le moule a muffins prealablement beurre avec la pate. Dans un four prechauffe a 200C, faites cuire les muffins pendant 15-18min pour un moule a muffins standard et 12-14min pour des mini-muffins. Laisser refroidir dans le moule depose sur la grille a gateau pendant 2min puis demouler et laiser refroidir completement sur la grille. Pour le glacage, melanger le jus d’orange et le sucre glace jusqu’a obtention d’un mélange soyeux. Decorer en zigzag et laisser le glacage prendre a temperature ambiante. How wonderful for your daughter to wake up to the smell of fresh baked muffins. I'll have a spot of tea with mine! Thanks Sandi.Although, she is still young to have a muffin, she certainly enjoyed the smell. je découvre ton blog aujourd'hui et je suis séduite, à bientôt ! Merci Cathy pour ta visite, cela me fait plaisir.